Posted by Douglas Fisher on Sunday, April 10, 2016 in News. Linda Rosenkranz, Director of Vanderbilt’s Outdoor Recreation Program, gave a presentation at WaM on March 30 about Outdoor Rec’s many activities and available resources. You can find her presentation slides, which are almost entirely trip pictures, in reduced-memory format, here. We are hoping to have her back at the start of Fall semester 2016, which is probably a more sensible time, and yearly after that. Fig: a pic from one of Outdoor Rec’s many outings. In high school I went backpacking frequently, and I went regularly while in college too. My favorite trips with friends in California, where I grew up, were San Jacinto, San Gorgonio, Kings Canyon and Sequoia National Parks (more often than Yosemite), Mt Whitney, and later in college, the Appalachian trail. After coming to Vanderbilt, I went on a few trips in Tennessee with Outdoor Rec (and Linda R), Patricia joined us on a back packing trip too. Camping on the trail doesn’t appeal to everyone, or even most, but many more enjoy a good morning or midday hike, without the overnight obligation. And there are lots of good day trips, to include the necessary driving, within range of Vanderbilt. 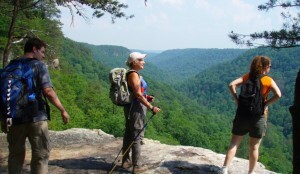 On April 23, I am signed up for one such day trip with Outdoor Rec to Short Springs State Natural Area. I know at least one WaM student will be coming. I talked with Grad Fellow Grace Chee, also an enthusiastic outdoors person, about a hiking club that would include occasional backpacking. For trips that involve significant logistics (i.e., arranging for driving, food shopping, etc) we thought that piggybacking on Vanderbilt’s Outdoor Rec program was best. Their programs are popular, but would probably often have space for a small group of interested WaMers to join (through normal signup), without undue inconvenience to others. We even talked about picking up some, or all, of the modest fees for Outdoor Rec’s short trips for WaMers in the case where its a club-endorsed trip and a student had a tough time covering it. In addition to piggybacking on Outdoor Rec programs, the WaM hiking club would operate separately for short trips to Radner Lake, Percy and Edwin Warner parks, even Montgomery Bell State Park (with lunch or dinner at the lodge there!) and some other nearby places. So, if you are interested in short day hikes, and an occasional backpack trip, with others at WaM and Vanderbilt, let me know — I am ready to pick up the mantle on this, and Patricia always loves a restful hike too. As with other ideas that take shape towards the end of the year, I’ll send out a reminder in late summer or early fall. Doug Fisher is the Faculty Director of Warren College. The opinions expressed here are Doug’s and not necessarily the opinions of Vanderbilt University.